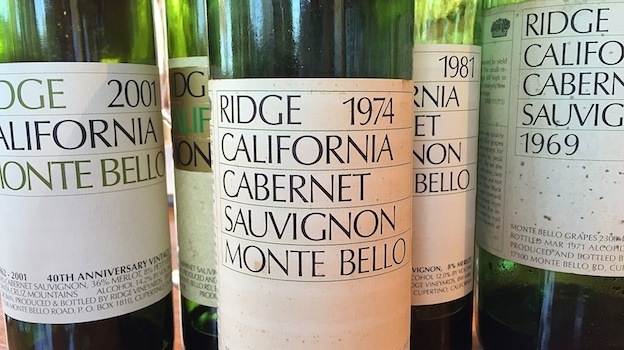 Since its first commercial release in 1962, Ridge’s Monte Bello has established itself as one of the most pedigreed wines in the United States, with a track record that stands comfortably next to the very best from around the world. For this tasting, Paul Draper, Ridge’s Head Winemaker, presented ten Monte Bellos; the five most recent vintages followed by one wine per decade going back to the 1960s, with each of the older wines chosen to represent a milestone in the estate’s distinguished history. Perched high atop the North Atlantic plate in the Santa Cruz Mountains, the Monte Bello property boasts a rich lineage that goes all the way back to the 1880s, when Italian-born doctor Osea Perrone bought 180 acres of land and began developing vineyards on these rugged hillsides. Even today, the drive up the winding roads that lead to the top of Monte Bello is arduous. It’s virtually impossible to imagine what conditions must have been like 130 years ago. Perrone built a winery that still serves as the Ridge production facility and made the first wine with the Monte Bello name in 1892. Sadly, the winery and vineyards fell into a period of disrepair during Prohibition. Theologian William Short bought the property in the 1940s and planted the vineyards that would later inform the early Ridge Monte Bellos, two of which were part of this tasting, before selling the estate. In 1959 the new owners, four Stanford Research Institute engineers headed by Dave Bennion, made a half-barrel of Monte Bello Cabernet Sauvignon. The success of that wine and the vintages that followed it inspired the partners to re-bond the winery. The first commercial release of the newly christened Ridge Cabernet Sauvignon Monte Bello was 1962. During this time, the partners began replanting selected parcels on the property. Paul Draper arrived in 1969. That year, he and Dave Bennion shared winemaking duties. By 1970 Draper was fully in charge. 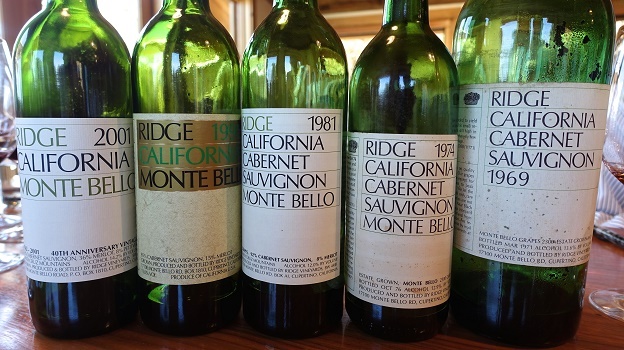 Monte Bello gained significant attention in 1976, when the 1971 Monte Bello claimed fifth place in the Judgement of Paris, the blind tasting of California Cabernet Sauvignons and Bordeaux that catapulted California Cabernets onto the global stage for the first time. The 1971 would go onto to claim the top spot in a re-enactment of the 1976 tasting thirty years later. The original partners sold their interests to Japanese pharmaceutical company Otsuka in 1987. From what I have seen current ownership appears to take a hands-off approach. When the modern-day history of California wine is written, a very special place will be reserved for Paul Draper. One of the most influential figures in California wine, Draper has championed what might be called a restrained, Old World style, especially beginning in the mid-1990s, when many estates, especially in Napa Valley, started making more powerful, concentrated wines. In that sense, Ridge has clearly benefited by being located in the Santa Cruz Mountains, far away from the intensely competitive and at times copycat culture of Napa Valley. Through decades of changing fashions, Ridge and Draper have stuck to their guns in making rigorously classic, age worthy wines that have earned them an intensely loyal following, not just in the United States, but around the world. 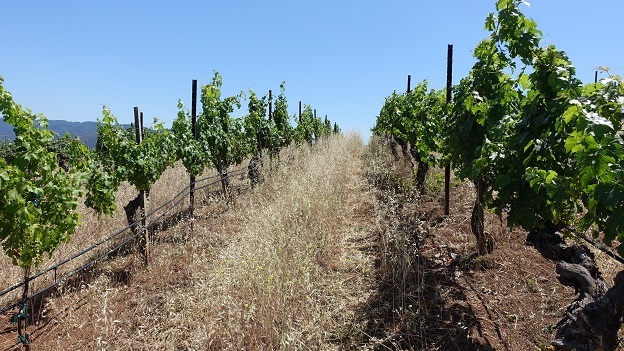 Ridge and Draper have also been instrumental in establishing Zinfandel as an important variety by focusing on the very best heritage sites throughout California. Paul Draper’s body of work can only be compared with that of a few American winemakers, including Bob Travers, Philip Togni and Ric Forman, but of the three, only Travers spent his career at one property. Likewise, Draper’s entire catalog of wines is contained within Ridge. Despite his considerable achievements, Draper remains one of the most humble producers I have ever met, while his boundless, palpable passion for wine seems to know no limits. Just as importantly, Draper has built a solid team around him, ensuring a level of stability and succession for the future that is exceedingly rare these days, especially in the US, where job mobility is far greater than it is in Europe. Vineyard manager David Gates joined Ridge in 1989 while Eric Baugher, who manages all day-to-day winemaking at Ridge, arrived in 1994. Gates and Baugher were both part of this tasting and had plenty of insights to share based on their own considerable experience. “When I was offered the job…because the original Ridge partners heard me speak about winemaking in Chile… they showed me the 1962 and 1964,” explains Draper. “And I had been tasting the BV (Beaulieu Vineyard) and Inglenook wines from the 1940s and 1950s. And I said, these guys, who had never made a wine in their lives, who just got out of the way and allowed the natural yeasts and natural malolactics to work…they didn’t filter, they kept the sulfur minimal, but effective…and look at these two wines; these are the two finest wines that I have seen in the 1940s, 1950s and early 1960s from California. And they made them, you might say, totally traditionally. And I said, if I join them – and I really liked the guys and their families – if I join them, I am going to have a chance to make some good wine. And that was it. 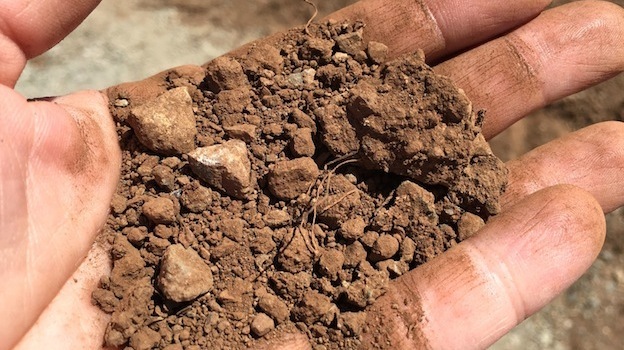 There is just something about this place; the cool climate and these greenstone/limestone soils…70% of the roots are in limestone…that is just special.” Special indeed. Even though Ridge has built an enviable track record, Draper and his team are always looking ahead. At the beginning of this year Ridge finalized a long-term arrangement with the New Peninsula Open Space District that gives Ridge agricultural rights in perpetuity to forty acres of vineyard land encompassing numerous blocks on the southern and eastern edges of Monte Bello that Ridge has previously not had access to. Today, Monte Bello is sourced from various vineyards on the property, including the four original ranches that are sometimes also bottled separately as part of the Historic Vineyard Series; Klein, Rousten, Torre and Perrone. Whole berry, native fermentations in open-top tanks are the rule. Pumpovers are used more actively during the early part of the fermentation cycle but then reduced towards the end of fermentation. Free run and press lots are separated, and the wines go into barrel dry. Some press lots might be blended back into free-run lots at this point, while others are kept apart for further evaluation at a later date. Malolactic fermentations, which are also spontaneous, tend to be done one to two months after the wines go into barrel. Blending starts in late January or early February, when approximately 80% of the lots are put together. The rest of the blend is finalized during the second racking, later in the spring. A touch of press wine is sometimes added in the fall, but by then the blend is essentially finished. Up until 1995, the blend was done immediately after harvest, but even with today’s timeline, Monte Bello is assembled far earlier than virtually all top Napa Valley Cabernet Sauvignons and proprietary red blends, which the winemaking team believes allows for greater integration of the various components. One of the unique aspects of Monte Bello is that it has always been aged predominantly in American oak, with only a touch of French cooperage. Throughout the 1960s Monte Bello was aged exclusively in neutral oak. Paul Draper bought the first new barrels for the 1971 vintage. During the 1970s and 1980s, the new oak percentage was in the 50-60% range. In 1987, barrels had been ordered, but the crop turned out to be unexpectedly light, so Monte Bello was aged in 100% new oak, as remains the case today. Canton, which is owned by Taransaud, is the cooper of choice, followed by Radoux and World, while there is always around 3-5% French oak in the mix. 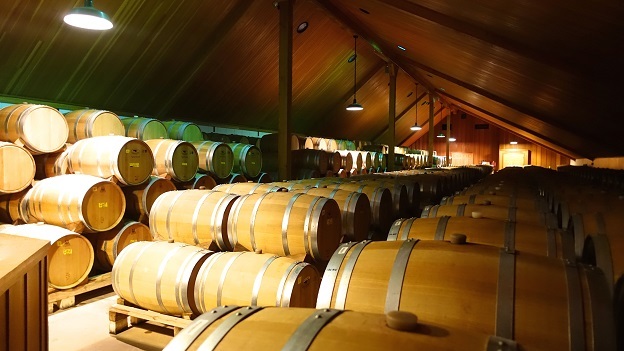 “French oak has tougher structural tannins than American oak, which might work well in Bordeaux, but over time we have found American oak is better suited to Monte Bello,” explains Draper. This unforgettable tasting ends with two vintages of Chardonnay, both of which are in great shape. 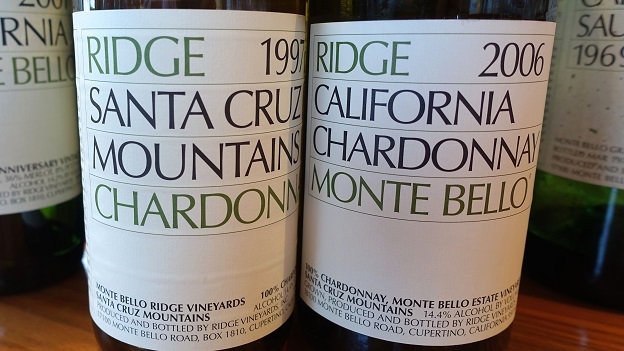 The early Ridge Chardonnays were made from the original Monte Bello parcels planted in the 1940s. Over the course of the decades, those vineyards became less productive to the point of being uneconomical to farm. The last Chardonnay made from the old vines was the 1984, and the vines were ultimately taken out in 1987. 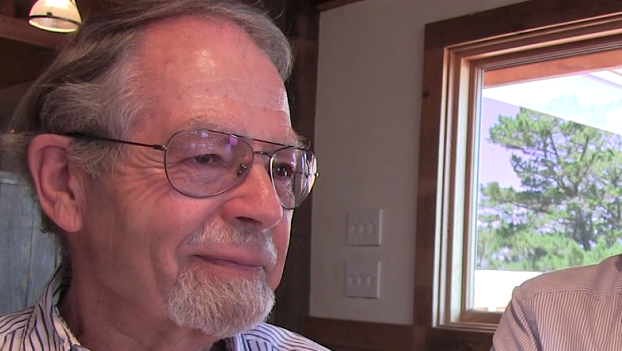 In 1985, Ridge began sourcing fruit from Jimsomare Ranch, a property that lies on the lower slopes of the Monte Bello hillside, but that Ridge did not develop. Jimsomare is planted with Clone 4 Chardonnay, which, according to Paul Draper, has the highest sugar to alcohol conversion ratio of any Chardonnay clone in California. As a result, the modern-day Ridge Chardonnays are all above 14% alcohol. Ridge took over farming of Jimsomare, now considered part of Monte Bello, in 1996. The first Jimsomare Chardonnay to be labeled ‘Monte Bello’ was the 1999, which explains why the 1997 in this tasting carries the Santa Cruz Mountains designation, even though all the fruit is from the present-day Monte Bello hillside. More recently, Ridge has planted Chardonnay at higher altitudes with older, California heritage clones with a desire to produce a Chardonnay that is more in line with the house style. Still, there is no question that the Jimsomare Chardonnays are endowed with considerable pedigree. Ridge’s commitment to quality, value and customer service has no equal in this country. Although the flagship Monte Bello, Lytton Springs and Geyserville bottlings get most of the attention, the Three Valleys Zinfandel is a reliably outstanding value, while the Estate Cabernet Sauvignon is without question the single finest California Cabernet Sauvignon in its price range. Best of all, Monte Bello remains one of the finest relative values in cellar worthy wine readers will find anywhere in the world. Monte Bello takes time to fully blossom, but the rewards for waiting are nearly immeasurable, something I am reminded of many times throughout this unforgettable retrospective.